Contraction in China’s manufacturing sector slowed while services sector expansion accelerated in January. Will the HK50 continue rising? Latest Chinese economic data were better than expected: manufacturing contracted at slower pace and services sector expansion accelerated. The factory activity contraction slowed as the official Manufacturing PMI inched higher to 49.5 in January from 49.4 in the previous month when a decline to 49.3 was expected. At the same time the official Non-Manufacturing PMI in China increased from 53.8 in December to 54.7 in January, a four-month high. The services sector accounts for more than half of the Chinese economy. Better than expected Chinese economic data are bullish for Hong Kong stock index. The Stochastic oscillator is falling but is still in the overbought zone, this is bearish. 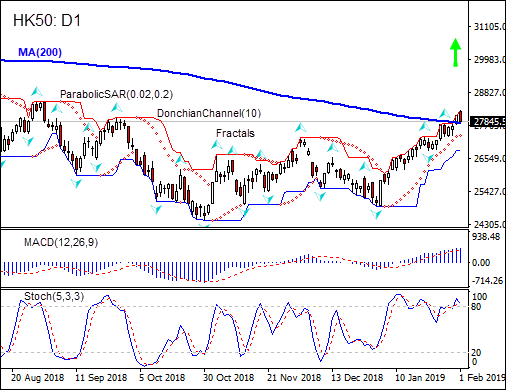 We believe the bullish momentum will continue after the price closes above the upper boundary of Donchian channel at 28208.0. This level can be used as an entry point for placing a pending order to buy. The stop loss can be placed below the lower Donchian boundary at 26832.0. After placing the order, the stop loss is to be moved every day to the next fractal low, following Parabolic signals. Thus, we are changing the expected profit/loss ratio to the breakeven point. If the price meets the stop loss level (26832) without reaching the order (28208), we recommend cancelling the order: the market has undergone internal changes which were not taken into account.